Finally! Help Selecting an LMS Has Arrived! Eleven companies responded to an extensive list of questions about their systems, resulting in a report of 400+ pages that include tables, profiles, and product reviews, as well as a valuable list of questions you can use or modify as you investigate your LMS options. How much for such a valuable report?!? With apologies to Tagoras, I’ll be frank: it’s CHEAP!! Okay, I’ll be polite: it’s VERY INEXPENSIVE. At just $199, this report will save you bookoo bucks in equivalent time spent trying to gather the information. Do the math: let’s say you earn $20/hour. Let’s round up the report cost to $200. Now I dare you to try to get this sort of information on your own in just 10 hours. Can’t be done. Can’t. Be. Done. So stop reading and go buy the report. Or take a look at the overview. Oh, did I mention the importance of having sorted out what you’ll need from an LMS, based on your elearning strategy? Tack another $25 onto your investment and get the aLearning: A Trail Guide to Association eLearning first. That way you’ll get the best value from the Association Learning Management Systems Report. And we sure don’t want to waste money, do we?!? How have various universities selected the course management systems (CMS) or learning management systems (LMS) they are now using? What processes did they follow? What criteria did they use? How did they involve the eventual users in the evaluation process? If your organization follows — or is considering — the university model for providing synchronous, instructor-led online educational events, you should take a look at Mark Smithers’ Learning and Educational Technology in Higher Education blog. He recently posted brief summaries and links to the original documentation. Sakai, Moodle, Blackboard Vista, Angel, and Desire2Learn are among the systems included. You might also find it interesting to see that the minimum amount of time a university team spent on such a process was about nine months, with several taking a year or more. Since his original post, several readers have submitted comments with links to additional online documentation. Read away! Just keep in mind that these processes and outcomes might not be a match for your organization, as these are large universities, well-funded (they might disagree, but compared to a small non-profit budget, they are swimming in money), and have internal staffing to support the sorts of systems that small organizations probably couldn’t maintain. Even so, it’s worth a look to see what they decided to evaluate and how they organized their review process. So far, I haven’t found similar resources for associations, so if you’re willing to share your association’s process for selecting a CMS/LMS and your outcome, or if you know of a summary of such information — send the info along! If you’re starting with decisions about your learning management system before working through a full strategic planning process, don’t expect to end up with a system that does what you need. Do expect that you could be wasting valuable time and much — probably all — of the money you spend on a system by moving forward too soon. If you haven’t developed a strategy for your learning programs (including your elearning offerings), no resource — even if it’s free — will help you make the right decision. Not you? 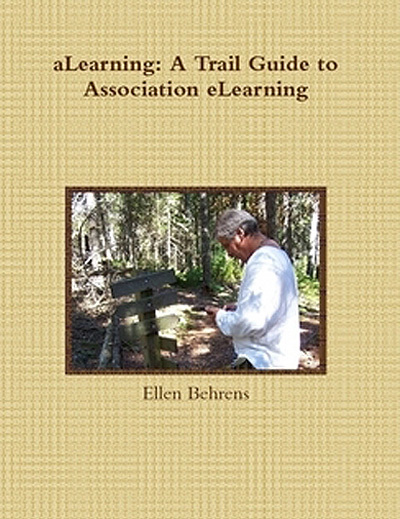 Maybe you’ll benefit from working through the *alearning: A Trail Guide to Association eLearning* book first (click the Buy Now button or here for more information), so bookmark this post for later. Brandon Hall Research (www.brandon-hall.com) is making three valuable reports available free — I’d post them here, but they have asked that the reports not be duplicated, so you’ll need to download them from BH directly. Learning Technology Products 2009: Learning Management Systems includes descriptions of more than 100 LMSs. They’re ordered alphabetically by company name and include products from all over the world, so be prepared to filter the options in some way to make the listing more accessible (for example, perhaps you’d prefer to work only with a company based in the US). Descriptions include basic information about the company and the product so you can determine whether it might fit your key requirements. Learning Technology Products 2009: Learning Content Management Systems provides basic data on each company and descriptions of the features of more than 40 LCMSs. Note that these are not rapid prototyping or rapid development products, but systems that enable complex development and deployment of large elearning curricula. Unless you’re in a large association or non-profit and plan an extensive online learning library which you will develop in-house, this is not likely a resource you’ll need. Learning Technology Products 2009: Authoring Tools is the go-to resource if you’ve wondered if you have more choices than simply deciding between Articulate and Captivate (you do, many more, and often for lower cost). No pricing is included; you’ll need to find that information out on your own. Some descriptions aren’t very complete; take a look at the Web sites provided for more information on products that strike your fancy. And some companies weighted their descriptions with not-so-subtle sales-speak: “develop highly engaging experiences” … “quickly develop”… “anyone can easily develop…” We learned a long time ago to be cautious of such claims, so read analytically, not subjectively — one person’s easy hike is another person’s Everest! Click here to access and download these helpful resources from Brandon Hall Research.